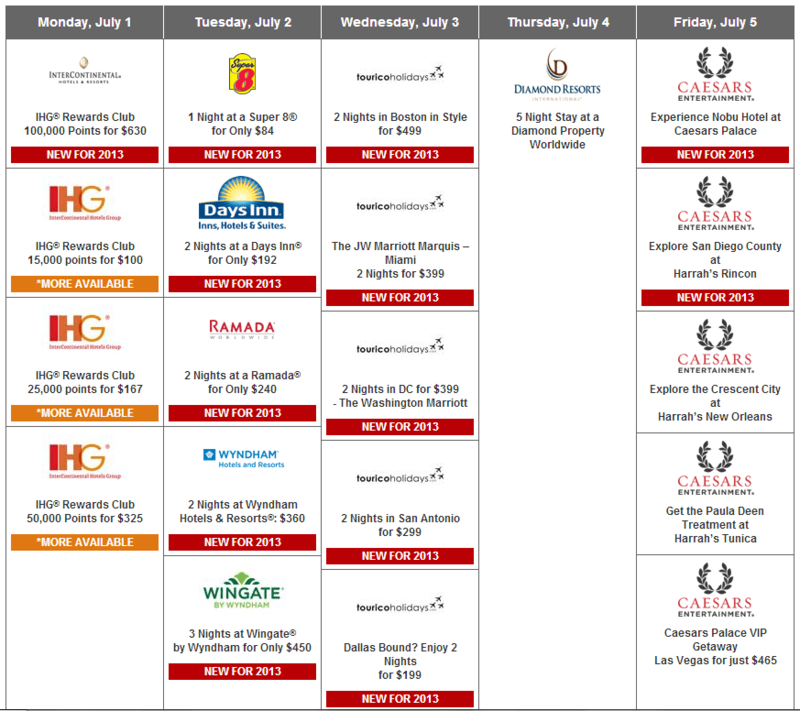 Daily Getaways Week Four Preview is out! The preview of the fourth week of Daily Getaways have now been released. From a cursory glance, it seems like there isn’t anything spectacular, but the IHG points sale are back. I am still waiting for Hyatt points and SPG points to be on sale. No luck so far, but hopefully they’ll be something nicer for the week after. This means there each point is between 0.63-0.68 cents before including the AMEX discount. This may be useful for those who already have intentions to book top-tier Intercontinental hotels, as that means a 50,000 points only will cost $310 (before AMEX discount) through buying versus $350 using the cash and points trick. Or even snagging a pointsbreak for only 5,000 points. The tradeoff is getting on at 1PM EST to snag one of the packages. If you think about the sales, that’s actually a lot of points that are being sold. But given that the amount is so close to the cash and points 0.7 cpm rate (which has been available for a long time) it means that it should be making money for IHG, so I wouldn’t worry about a devaluation. Oh geez. That means each Wyndham point is now being sold at 0.6 cents with all of these packages. Remember, Wyndham converts to airline miles (including United and American) at a 2.5:1 ratio when transferring 8,000, 17,500, and 32,000 points at a time, so that means essentially each airline mile is 1.5 cents. Certainly a 25% discount on buying miles even at the lowest rate that UA/AA miles will be sold regularly (2.1 cents with the UA mile accelerator) and just over 2 cents with an AA miles sale. It might be worth it if you have an award in mind, but I personally wouldn’t buy them if I didn’t have a redemption in mind with the changes that has happened with UA miles including change fees to general members more than 21 days out, and limiting connections on award tickets on Europe/Asia redemptions. I am not familiar with redeeming Wyndham rewards for hotels to know whether those points are a good deal, but given that Wyndham has devalued hotels without advance notice I would recommend you figure the value of a specific redemption that you have in mind and make sure that it is a better value buying points. There can be value to be had from these packages, but I’m not sure whether stays with at these rates qualifying for points/stay credit. Generally, if you have hotel status it is probably going to be a better deal not getting these certificates. Again, you might be saving a small bit of money, but buying the certificates forces you to stay at hotels only. From the details it seems you could get some value from what you’re buying them for, but I’d at these rates (~$500 for Caesar’s Palace Las Vegas/Nobu Hotel) I’d rather have flexibility over where I want to stay. Since Las Vegas hotels generally aren’t that pricey (and now that the MGM/Hyatt partnership has kicked in) I would say stacking an AMEX FHR/Virtuoso Rate with Hyatt Points/Stay Credit is probably going to be a deal that is as good if not better. Remember, AMEX cardholders get an extra 10% off although there have been issues with using non-US credit cards. If you have any problems with that and you really want to get a package, consider getting a prepaid visa/amex in the States. You can access the full list of packages for sale here. What can you with 15,000 IHG points? 3 nights with pointbreaks, 1 night at a Holiday Inn that prices at 15,000 points, ~2,000 airline miles. Today,June 28th.From 1PM , I have been trying to purchase the IHG points but couldn’t. U.S. State ( for any C.C.,not only for AMEX). I have also noticed in the Daily getaways rules & regulation that all the deals only apply to US residents. a way to overcome the above ? Yes, I use a US credit card with a US billing address. You could try using your address and putting your 00000 as ZIP but I’m not sure whether that will be processed.